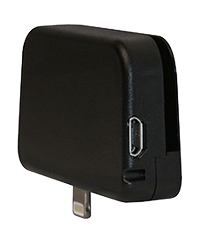 The iMag Pro II mobile reader is an encryption capable magnetic stripe reader for all Apple 8-pin mobile devices. Use your mobile device to read credit cards, signature debit cards, and gift cards. The iMag Pro II reads up to 3 tracks of card information with a single swipe in either direction, providing superior reading performance for your mobile device. The snug fit design was built for comfort and mobility, allowing you to accept credit card transactions wherever you go. A merchant account is required to accept credit cards. Apple hardware not included.